As always we received tons of marvellous questions this week! What an absolutely marvellous question, also a double edged sword because my theory on it is probably not backed up by my own practice. I grew up in a village called Crookham and the nearest town was Fleet which was about 35 miles outside of London. Fleet had two secondary schools (high schools) Spike Stent was in my school, he was a few years older than me, also from our little town is Matt Butcher who is one of the best sound engineers in the world – Second to none. There are so many people I grew up with in my very small village and town who have grown up to work professionally in the music industry. They all came from about 35 miles outside of London, it would take about 30 minutes on the train, or you could take the fast train in the morning and get to the center of London in about 20 minutes. It was pretty close, however, if you’re from the UK or Europe, you know half an hour is a long ways away. It’s not like in America where people say “it’s right down the street” when it’s actually a 45 minute drive away. For us, that’s a whole different world, we would never think about driving for 45 minutes to go out for the night. – It’s a very different sort of thing. I know there were a lot of people who got very very successful in my little town. I can think of 20 or 30 people in my age group from my small town who are very successful in the music industry. However, all of us did eventually move or at least create our career in London. I’m not saying lots of people don’t live outside of it now but, I think that there was an inevitability that if you were going to be in a band that had a record deal as I did and so many of my friends did, you would go to London and you would record in London. The more I think about it I believe that yes, going to a major city was a big part of me being able to do what did. When I got a record deal that went on to have chart success, all of the members of my band were just outside of London or in London, we ended up staying overnight in London and working there frequently. – It’s just where everything was located. The reality is though, for me now that I have more of a career, I can mix or even produce remotely by building tracks production or mixing remotely. I’ve got artists I work with who’s albums I mix from all over the world, a couple of them I have never met in person I’ve only ever Skyped with them. So if you’re going to aim to be a mixer you can be anywhere in the world. Inside the Produce Like A Pro Academy, there are people all over the world. There is a guy who I have given private lessons to that I have just started and will continue to refer and recommend work to and he’s based in Australia. There are other people who are up and coming and are starting to produce really really incredible work all over the world who I can refer work to. They don’t have to be working with somebody in their own country, and they aren’t necessarily in big cities themselves, so it’s kind of a catch 22. If I were a musician again I would probably pack up my guitar and move to a modest location in a big city and work from there as a musician. We were just talking about this today in the session that we did, Nashville vs LA. You can live in either city and work but there’s never any conversation of LA vs Nashville vs Some random city in some random state. The point is if you want to be a working musician then you do really need to be in a hub where there are tons of venues and tons of studios. – That’s just common sense. If you want to be a working producer and working engineers it’s probably best to be where there are a lot of musicians and a lot of studios. Now if you want to be a mixer take a look at Andrew Scheps he is not only mixing in the box he is mixing on a pair of headphones. When he came to my studio and we did that video I had some Focals up and I asked if he was fine showing off the Omni channel using the Focals, and he had no problem with that, he’ll work on whatever is available. Now he’s back in united kingdom working over there because he’s mixing. The reality is if you want to build your career especially as a musician and then as a producer and engineer, you need to be around musicians and studios. It doesn’t mean you can’t work remotely, of course you can but you are reducing your opportunities. If you’re doing film and tv licensing music for instance, and you are submitting music all over the world, you can be anywhere. You could have a little home set up and a virtual way to play instruments off a keyboard, USB keyboard, guitar, one vocal mic, whatever it might be, program the stuff and build your own tracks and music, and you can do that anywhere in the world. A lot of very successful people doing film and tv licensing music are working from absolutely anywhere. Think of Mick Gordon, he’s in Australia, but he’s not working with game companies who are necessarily Australian, some of the biggest games companies are from all over the world but he’s making music for the biggest games in the world from Australia. I think this is important, you need to figure out what is it you want to do. 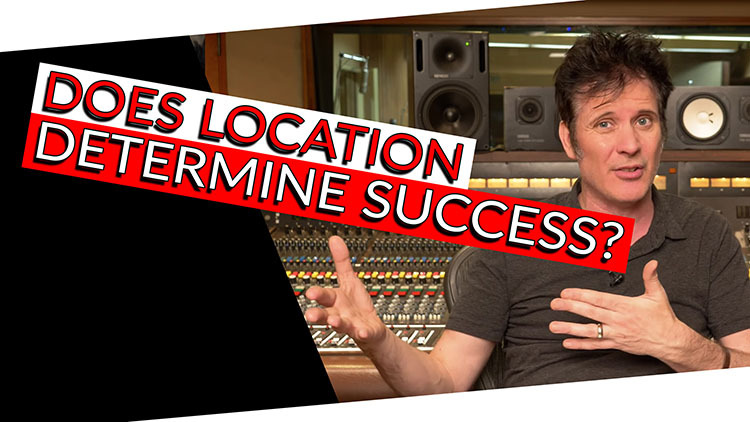 If you want to be a musician you got to bite the bullet, you need to go to a place where there are studios and venues. If you want to be a producer and an engineer, probably more often then not you’re going to have to go and be in a major city, or live just outside one like I did with a decent commute in and out. But if you’re going to be a mixer and you want to mix songs for free, do a one-off song to try and get somebody’s album, you can do that from anywhere in the world and many many of my clients I have not met face to face. I’ve just Skyped with them or phoned, sometimes I’ve only emailed. There have been a couple of times that I haven’t even spoken to the artists whose albums I’ve mixed, It’s rare but most of the time they don’t attend the sessions. I think you have to define what it is you want to do, if you want to be a producer-engineer that’s one thing, If you want to veer more towards the mixing then you know what you have to do. It’s good to have face to face time, so how do you have face to face time? Go to NAMM, go to AES, go meet musicians, producers, and engineers. If you’re a mixer Introduce yourself, offer to mix a song for free, if they like it maybe they’ll give you more work.